Translation: Kazuyuki Yoshimura. 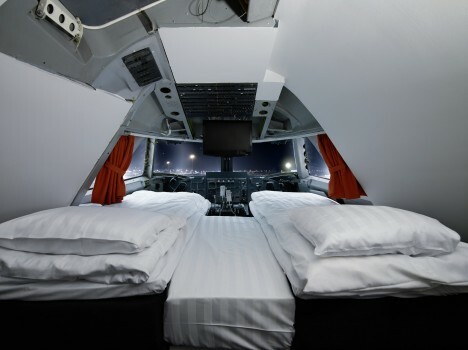 Once you arrive at Arlanda Airport you can get the exciting experience of spending the night on a real Boeing 747 on the ground. You also have the opportunity of booking the Honeymoon Suit in the cockpit. How cool is that? But actually, that´s the most expensive room of the Jumbo Hostel, with a price tag of 300 EUR for the double suite per night. Otherwise you can book in economy, a fantastic room supplied with 3 beds, a bathroom and cupboard as one of the original over-head lockers, then you go down to a price of 35-90 EUR depending on whether you share or not. Lots of details and original features have been kept onboard, so the hotel actually works out as a museum in itself. These small touches make the Jumbo Hostel very unique, including having the in-flight meal as breakfast. A brand new accommodation with modern interior decoration. A hostel with a difference.